As per the promise I have made in “Somebasics about Index in SQL Server” article, I am coming up with each Indexesof SQL Server and first and most important is “Clustered Index”. As I told in previous article too that Index is the key ofperformance, good and managed Index could boost up your speed of retrieving ofdata from table. Clustered Index contains actual data of the table in leaflevel pages in logically sorted order (to understand root and leaf level page, clickhere). Since it is logically sorted, it doesn’t need to go for all datapresent there in Index. For example if you are looking for the phone number of “RiteshShah” in telephone directory, you can move to a page which has phone number of theperson whose first name starts with “RI” and once all instance of “RI” over indirectory, you don’t need to move on as there is NO CHANCE, you will get “Ritesh”anywhere in directory except those particular pages. BTW, if you don’t have clustered index on your table, thanyour table would be called “HEAP”,which wouldn’t not have logically sorted data so if you are searching for “RiteshShah”, you can to check complete table as you never know, where you will find “RiteshShah”, just one method, go each and every row of table and check for matchingcriteria. Like any other columns, you can define clustered index inmore than one field too and all the columns covered up under the index, calledkey column. –> You keycolumn or combination of key columns should be unique and not null. If your Youkey column or combination of key columns are not unique than SQL Server has toadd one more hidden column of 4-byte INT to make it unique. However, you can’tsee that hidden column neither can query it directly; it would be purely forSQL Server’s internal use. –> It shouldbe short as wide key value would increase the depth of Clustered Index and willreduce the performance a bit and also increase the size of non-clustered indexas it is being there as a reference in all non-clustered index. –> Selectless changing or no changing fields for you clustered index as Key valueindicates the location of page where actual data resides, if you change thiskey value, row has to be deleted from that page and has to move to anotherappropriate page which reduces the performance and increase unnecessaryoverhead to IO. 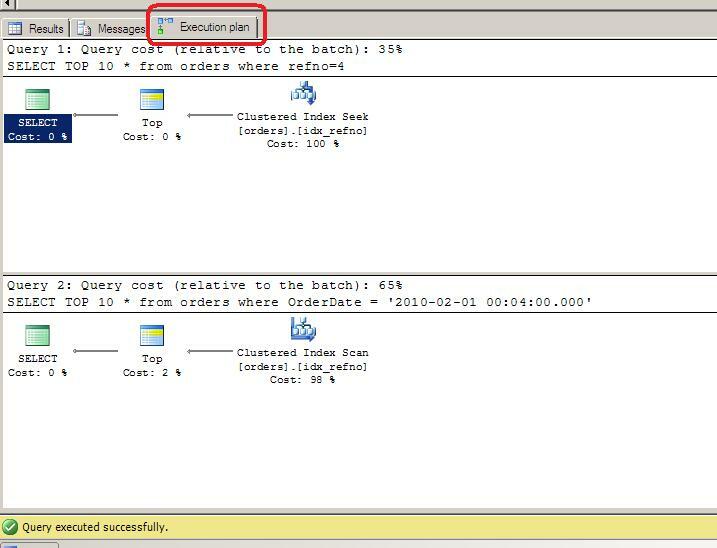 Generally whenever you make Primary Key in any of yourtable, SQL Server itself create clustered index on it but if you want to keepclustered index on any other column(s) due to high selectivity on thosecolumn(s), you can do it. Have you got bored of so long theory? Let us do some practicaland check it out? 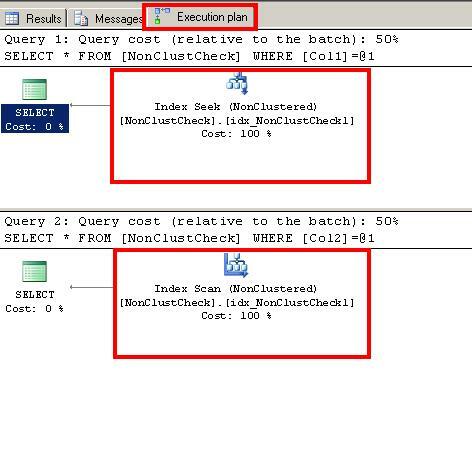 If you execute both the query with “Actual Execution Plan”,you will see first query is having Index Seek and second query is having IndexScan. Seek and Scan is really interesting topic which I will coverlater but just keep in mind that, Seek is good, Scan is bad as it will checkall records of the index. When I was novice with SQL Server and mainly working with .NET applications, Index seemed to me as alien of the planet of MARS. I was always confused about Index concept and always making mistake in choosing clustered and non-clustered index for particular field. When SQL Server and database technologies attract me, I had started to understanding Index concept in details few year back and this article is coming from my own experience and learning. Though Clustered Index is not a concept of Relational Database, it is very useful for performance improvement in highly volume transaction processing system. Basically Clustered Index is a kind of data structure that provide fast data access. 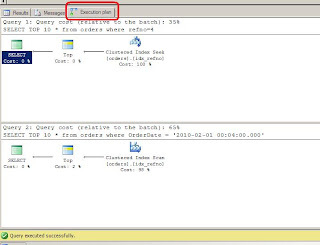 There are two types of index available in SQL Server 1.) Clustered Index 2.) Non-Clustered Index. Today we are going to talk about 1st Option which is Clustered Index. You can have maximum one clustered index per page because clustered Index stores sorted physical data in leaf level and this is obvious that you can sort data in one direction only so that you can have maximum one Clustered Index in database table. However, you can define clustered index on one or more than one field but try to keep as less columns as possible in clustered index. When you create Primary Key, unique index is automatically getting created on column(s) which is Clustered Index by default; however, you can make it non-clustered while generating Primary Key. While choosing the field for Clustered Index, you should consider few things in your mind. Column shouldn’t be low-cardinality. Low-cardinality means, it is the column which contain very less distinct value. For example, if you consider Grade filed (I guess there should be four grade A, B, C, D), you maximum having 4 kind of value in column. Column should be highly selective in your WHERE clause, GROUP BY clause, JOIN and ORDER BY clause so that you can get maximum benefit out of it.